Bonnie is well-known as a fierce advocate for animal welfare and social justice issues. She has worked alongside such local non-profits as Planned Parenthood, Humane Society of Southern Arizona, Primavera Foundation, TROT and many more. Her philanthropy has made an enormous impact on the citizens of the Tucson community and the animals in their care. Bonnie has been a long-time supporter of The Hermitage and is happy to further champion the cause by joining the board. Bonnie shares her home and life with her five beloved cats. Robert has a B. A. in Political Science from American University in Washington, D.C., a Masters in Public Administration from The University of Arizona and a law decree from Seattle University. He was in private law practice in Tucson beginning in 1988, retiring in 2018. He practiced in several areas of the law, including estate planning and representing businesses, both for-profit and non-profit. Robert previously served as President of the Board of Directors of The Tucson Community Cable Corporation (later called Access Tucson), The Educational Enrichment Foundation as well as Information & Referral Service. He loves all animals (with a special affinity for cats!) 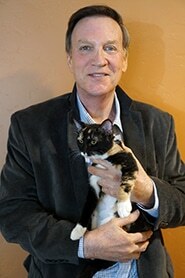 and is honored to serve on the board of The Hermitage No-Kill Cat Shelter. He and his wife Trudy have three cats, all rescues, including one from The Hermitage. Born and raised on a small dairy farm in Wisconsin, Cathy developed an appreciation and love of animals at a young age. She moved to Arizona in 1999 to pursue her career in healthcare and recently retired as the Chief Financial Officer from the Children’s Clinics. She is the doting mother of two cats and one dog. 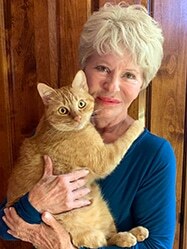 Retirement has allowed her to expand her love of animals and join the Board of the Hermitage to pursue their mission of advocating for animal rights and ending needless euthanasia of at-risk felines through protection, adoption, and sanctuary. Born in southern California, Maggie grew up in Prescott and lived most of her adult life in Tucson. She earned a Bachelor of Arts degree in general and special education from Northern Arizona University in Flagstaff. After spending 12 challenging and wonderful years supporting K-12 students with special needs in the Arizona, New Mexico, and Alabama public school systems, she transitioned into the non-profit world by joining United Cerebral Palsy of Southern Arizona in 2006. For the last eight years, Maggie has enjoyed working as a supervisor in the Human Resources Department. Currently, Maggie and her spouse share their home with eight cats, all of whom bring great joy to their lives every day. Being a lifelong animal lover and advocate, it was a natural fit for Maggie to join The Hermitage Board in 2016. She feels truly humbled to be even a small part of realizing The Hermitage mission. Dr. Lindsay McCrady grew up in Tucson, AZ and completed her undergraduate studies at the University of Arizona and earned a B.S. in Veterinary Science with a minor in Chemistry. During that time she also worked as a veterinary technician at VCA Valley Animal Hospital and became manager of the emergency service. 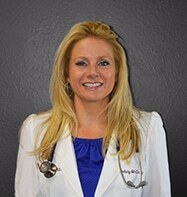 She then earned her Doctor of Veterinary Medicine degree from Colorado State University in May of 2009. She then moved to Florida and completed a specialty internship in Small Animal Medicine and Surgery. She has eight years of experience as an emergency veterinary technician and has a strong interest in Emergency and Critical Care Medicine. Her other professional interests include internal medicine and small ruminant medicine. She loves her two cats and two dogs, whom are all rescues! After being raised in a Chicago suburb, Mary moved west where she could expand her menagerie to include horses, chickens, a goat and various other animals. While raising her four children, she earned her nursing degree, then worked as an intensive care nurse for many years. During this time and continuing after retirement, Mary has volunteered in shelters, mainly in the medical areas. 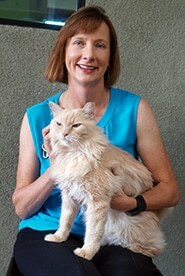 As a Board member of two different animal groups and Medical Coordinator in San Diego, she’s organized and written protocols for large surgical operations. While living in Mexico, Mary served as the Director of a shelter in Cuernavaca. 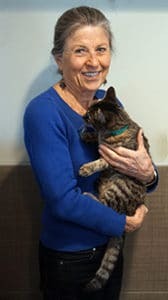 During her more than 20 years of volunteer service, her goal has always been to make sure each cat in a shelter receives the individual care, both medical and personal, that it needs. 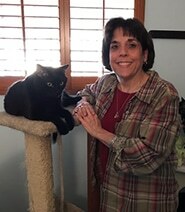 Mary moved to Tucson four years ago and now shares her home and life with her two cats, one dog and three medical foster cats. Kristen has lived off and on in Tucson for the last 43 years. She graduated from the University of Arizona with a bachelor’s degree, and obtained her master’s through Northern Arizona University. Kristen has volunteered at The Hermitage for almost two years, and is the current volunteer facilitator and a mentor. Kristen has two grown children and three feline children, Star, Stormy, and Charlie. 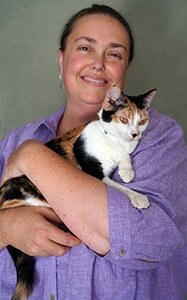 She believes in The Hermitage, and is so grateful that such a cat haven exists with its dedicated staff and volunteers. Bio & Photo Coming Soon. The Hermitage Board of Directors meets monthly, usually on the fourth Thursday of each month. Public attendance is welcome. If you are interested in helping by becoming a Board member, please fill out our application. Applicants are subject to Board approval.